Process to Repatriate Myanmar Rohingyas Stalled - Integration Through Media ....! (VOA): A month since the Myanmar and Bangladesh governments reached an agreement to begin the repatriation of mainly ethnic Rohingya refugees to northern Rakhine State, the process appears to have stalled. On January 16, the two governments agreed to return the estimated 688,000 people who have fled to Bangladesh since August. The process was due to begin on January 23, but later it was delayed indefinitely by Bangladesh. Myanmar insists it is ready. It has established two reception centers, one in the very north of Rakhine for those returning by land, and one further south for those coming back over the Naf River, which is the official boundary between the two countries. Once processed, the refugees will be transferred to what Myanmar officials have said are temporary camps elsewhere in Rakhine State. The agreement attracted criticism from the international community and Rohingya currently in refugee camps in Bangladesh. “People here feel quite strong. 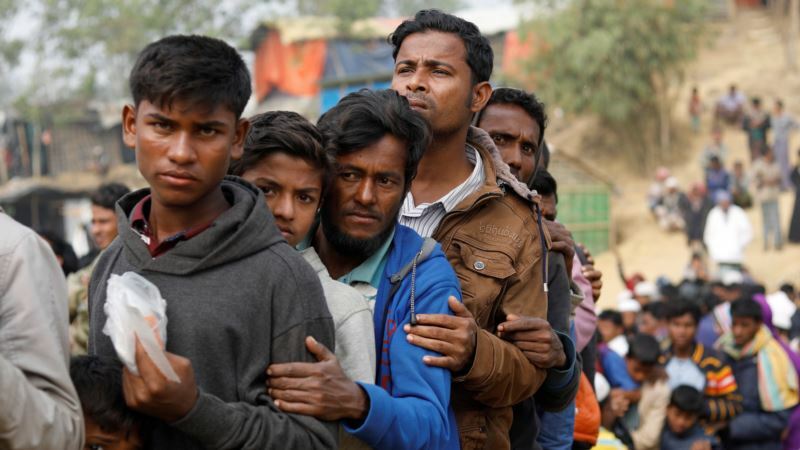 They don’t want to go back unless they are ensured their citizenship rights and U.N. security,” a Rohingya in southern Bangladesh where the camps are located, and who didn’t want to be identified, told VOA. Aron said that one of the key concerns is the ability for the refugees to be able to return to their place of origin. “Reception centers have been built with housing facilities, but there’s been no clear timeline laid out for exit from those reception centers,” she told VOA. Following the outbreak of violence in 2012 across Rakhine more than 100,000 people, mainly ethnic Rohingya, were moved to internally displaced persons camps where most of them remain today. “So I think articulating this plan, and offering support for rebuilding lives within the place of origin would be one positive step to addressing these concerns,” said Aron. Speaking before the U.N. Security Council in New York this week, Filippo Grandi, United Nations High Commissioner for Refugees, said “the causes of this crisis originate in Myanmar” and that a genuine search for solutions must begin. “Let me be clear. Conditions are not yet conducive to the voluntary repatriation of Rohingya refugees. The causes of their flight have not been addressed, and we have yet to see substantive progress on addressing the exclusion and denials of rights that has deepened over the last decades, rooted in their lack of citizenship,” said Grandi. A UNHCR spokesperson told VOA the agency believes the safeguards for potential returnees are absent, and that there are still restrictions on access for aid agencies, the media and other independent observers. At the root of the issue is the fact that many Rohingya are denied access to citizenship in line with the 1982 citizenship law, which was introduced by former dictator Ne Win. The Rohingya are not officially recognized as one of Myanmar’s 135 “ethnic races,” a list that was first made public in 1990. The government has introduced a National Verification Certificate process that, if successful, allows people to apply for citizenship, but it has largely been distrusted by Rohingya and Rakhine people. There are concerns in the Rakhine community that the process could mean more Rohingya being granted citizenship. Aron said that a way for the government to improve trust in the NVC would be to better explain the process to those who are applying. “I think people need to know what they are signing up for before they agree to apply for citizenship through this process. If they can see that there is a reasonable arrangement and a pathway to citizenship, even if they are ultimately rejected, then that could build confidence,” she said.